The question I hear the most from business clients when discussing intellectual property is, “…should I trademark my business name/brand/logo”? The answer to this question entirely depends on the particular business and the particular client, and, in my e-book below I list the 10 most important things to bear in mind when trying to make this decision. 1) Do I need a Trademark? In an ideal world, yes, every business would have their “brand” protected from those seeking to take unfair advantage of it. 2) Is it a valuable right? Yes, it can be, and that will be determined normally but the value of the business itself – the other way of course to look at it is to see it as a means of ring fencing your branding whilst you build up your business. 3) What kind of protection does a registered Trademark give me? That will depend on what type you get – so, you could get an Irish Trademark, a UK Trademark, or a European Trademark, or a US Trademark – so, if you planning, like many Irish businesses do, to start in Ireland and then expand to the UK it would possibly not be sensible to get an Irish, then a UK Trademark when one application for a EU Trademark would have covered them both. 4) How long does a registered Trademark last? Forever, if you pay your ten yearly fee to the Irish Patents Office. 5) Can I sell a Trademark? Yes, you can, and in fact, here at Reilly & Co, Solicitors we can explain how your intellectual property can best be protected and exploited. 6) I have the domain name, the company name and another name I bought at Companies Registration Office – is that all I need? Not for a trademark it isn’t, but, if you have been trading using the name then you will have most likely built up some “rights” in the name – a registered Trademark is a powerful right and would be seen as the “Gold Standard” in terms of protection. 7) I am concerned about someone trying to take my name, what can I do to protect it? 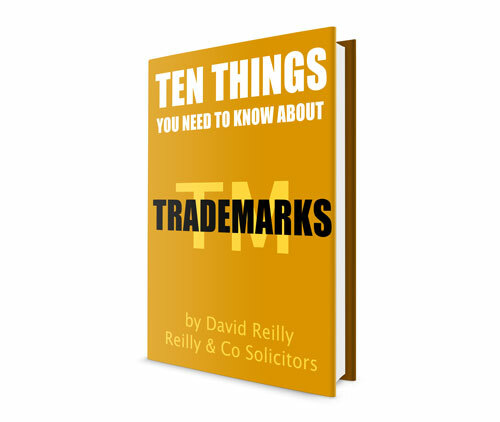 You can Trademark the name, or, if your name is not already Trademarked it is permissible to put the “TM” next to it, but, not the “R” in a circle – this provides a degree of protection under common law. 8) Someone else is using the same name as me, or, one very much like it, shall I write to them to have them stop using it, or, will you send them a Solicitors Letter? A very dangerous position to be in – great care has to be taken here otherwise this type of situation can blow up in your face very quickly. Around 6 months would be a safe time period, but, if there are objections it could easily take longer. Note that if “passed” the date that the Trademark is registered at is the date it was first dealt with by the Patents Office which means that you do not “lose” if things take a little longer than expected. That will depend on the type of Trademark you want as there are a number of options – we will be happy to discuss what type of Trademark would be best for your business and provide a “guesstimate” of success in your application – some clients have more of a risk appetite than others when it comes to submitting a Trademark and we take all of that into account before going ahead with any application.